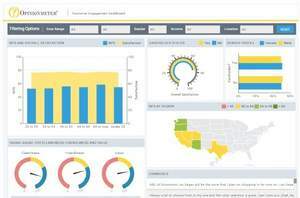 SAN LEANDRO, CA--(Marketwired - Sep 30, 2015) - Opinionmeter International (OMI), a leading provider of advanced survey and data capture solutions, today announced the addition of business intelligence dashboard capabilities to its survey platform. The new functionality is the result of a partnership with Dundas Data Visualization, Inc. which supports full integration between the OMI platform and Dundas' Business Intelligence (BI) and Data Visualization solutions. "At OMI, we've spent the last 40 years being an innovator in the field of survey and opinion polling technologies -- always looking for new ways to bring leading-edge capabilities to our customers," said Morgan Strickland, CEO of Opinionmeter. "Our customers must be able to see the big picture and drill down into the details to find answers to questions posed at the high level. The Dundas BI solution enables our survey customers to expand their data mining capabilities while not overburdening them with unnecessary complexities. This allows them to follow their train-of-thought and find the answers they're looking for with a few simple clicks." When looking to expand its dashboard capabilities, Opinionmeter evaluated several BI platforms that could help their enterprise customers easily see the 'why' behind their survey data. Dundas provided the right balance of enterprise-ready features, security, seamless integration support and powerful analysis functionality OMI needed for their new and existing customers. "We chose to partner with Dundas because of their unique combination of powerful analysis functionality, seamless integration support, and ease of use", says Strickland. "The resulting enhanced capabilities will help Opinionmeter maintain its leading position in the global survey market, providing robust survey and data capture capabilities with advanced data reporting and analysis." "Dundas is excited to partner with Opinionmeter to provide their users with a world-class BI and dashboard solution," said Dundas President and CEO Troy Marchand. "The advanced sharing options and the seamless integration between survey management and data analysis platforms that Dundas BI provides, ensures that Opinionmeter's enterprise customers have accurate real-time views into all data collection initiatives." With over 40 years in the industry, Opinionmeter is an innovator and leader in advanced survey and data capture solutions that provide real-time access to mission-critical data. Opinionmeter's suite of feedback technologies gathers data from multiple touchpoints across multiple channels (web, mobile, kiosk, SMS, etc.) to build a comprehensive and nuanced view of the target audience -- all within a single, integrated platform. Dundas BI, Dundas and Dundas Data Visualization are trademarks of Dundas Data Visualization, Inc.